VAD75 smooth jazz project. It's about the melody and the groove. Elegant compositions with attention to melodic detail, and compelling fresh grooves are trademarks of the VAD75 smooth jazz project's sound. Our music delivers an awesome, dynamic, and unique contemporary jazz sound, evoking images of the inner city. Listeners will appreciate the mixture of the funk and fusion in these contemporary smooth jazz tracks. Packed with intensity and complexity, our music maintains a high level of integrity and insight and all tracks are perfect for quality background music for all kinds of events. Add a touch of elegance and please even the most discerning music lover at your next party. "HORIZONS" came about via a collaborative approach to making music. 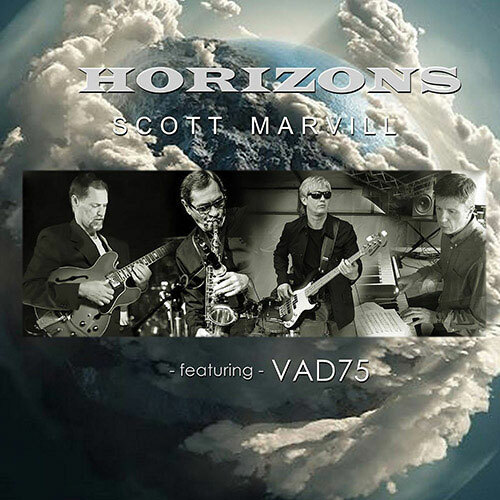 VAD75 | smooth jazz project has had much success thanks to their approach and creative process and when Marvill learned about this approach he was in. Being an Indie Artist allows an open schedule from song idea to completion. If you have the luxury of time and ability to really create an offering of the highest quality you walk away with a timeless end result worthy of everyone’s efforts and “Horizons” is just that, allowing the sound to grow to its full natural maturity, exactly where it needs to be. A very special thanks to PhaseGlobalRadio.Com for their support! The World’s First Smooth Jazz & So Much More Music, Global Radio! Copyright © 2009-2019 BMI USA Broadcast Music Inc.